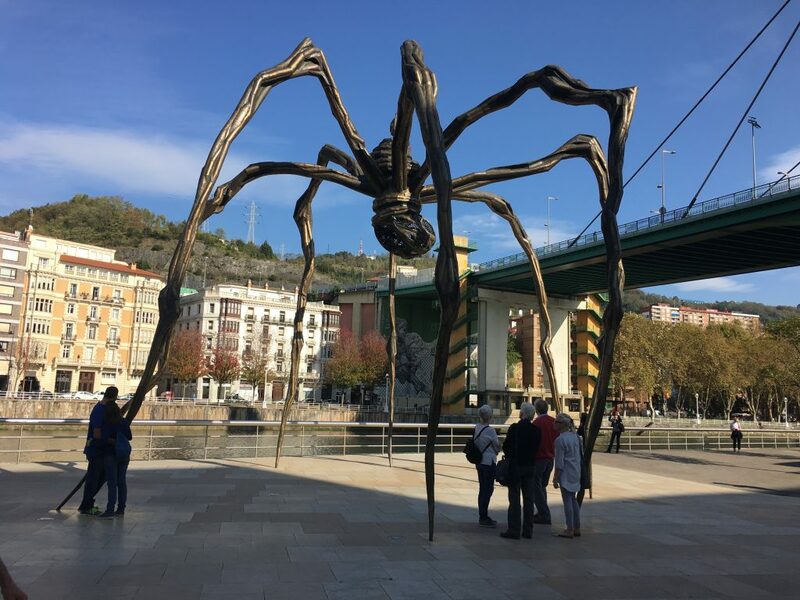 The following morning we set off for Bilbao, the Dutch couple next to us tried to persuade us that the journey was easier and more enjoyable by bus and we might as well remain parked in the aire, but as we were moving further west anyway it seemed an unnecessary duplication of travel. I got the luxury of being a passenger and it was a beautiful journey along the coast road through villages, past farms and up and down wooded hillsides. For countryside so close to an urban centre it was remarkably unspoilt and very beautiful, the timber framed Basque estancias lending it an alpine character. Paul, of course, was focused on the driving and unable to enjoy the views unless they were in his line of sight. 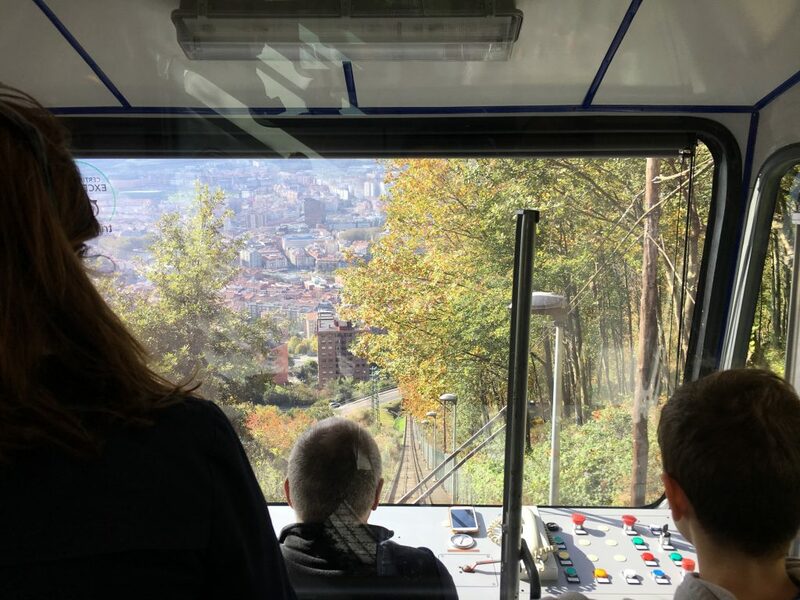 We had decided to park near to the funicular station in Bilbao, on the North East side of the city. There is plenty of free parking here and the funicular is €0.95 per person each way. 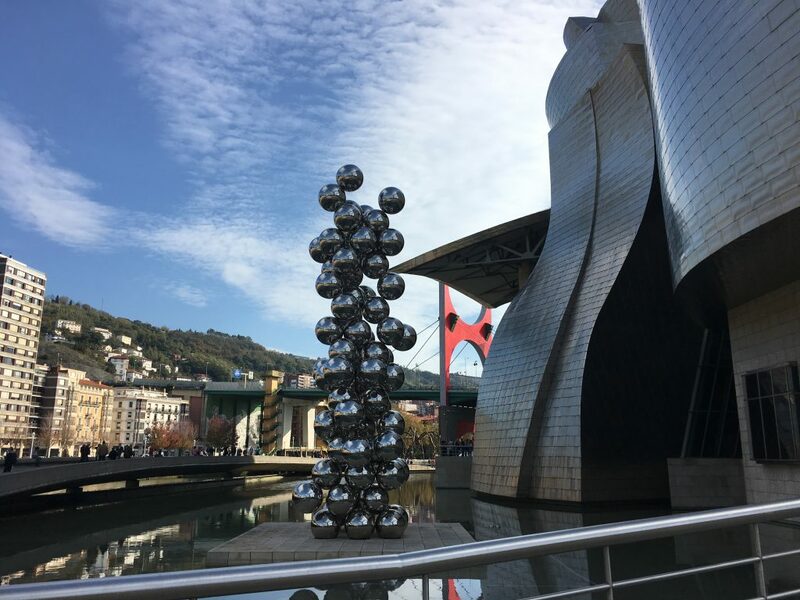 It was far easier than trying to navigate through the city and less expensive than the Bilbao aires. We didn’t end up staying here overnight but it felt peaceful and safe so I wouldn’t have had any issues. Our focus for the day was a trip to the Guggenheim museum. 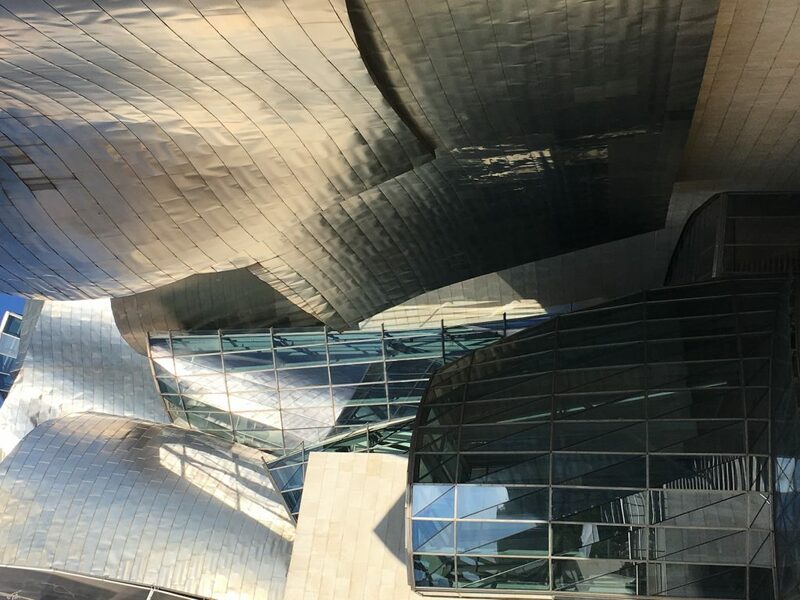 We had been to the Guggenheim in New York and wanted to see how it compared to Bilbao, personally I found the New York space more cohesive inside; the complexity of the Bilbao space seemed to create too many odd shaped corridors and corners. The Bilbao building was certainly impressive from the outside though, not better, but different. 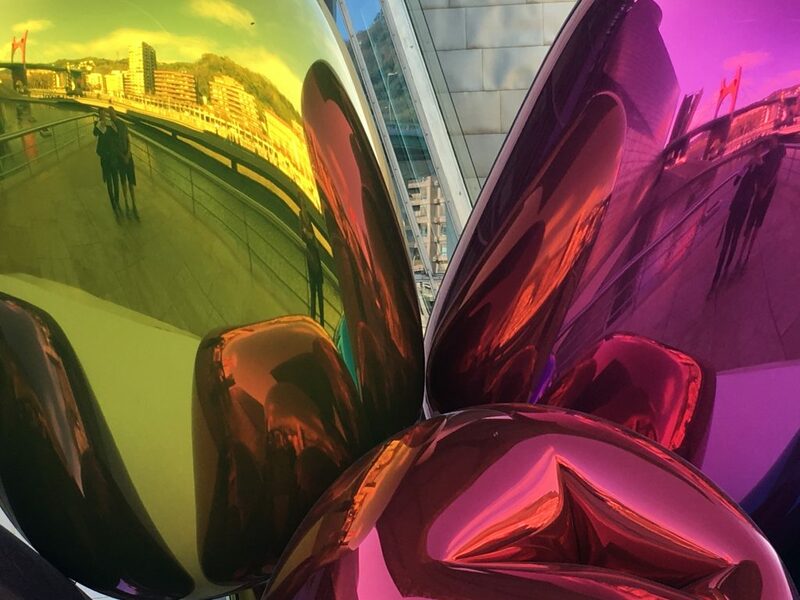 Neither of us are really art enthusiasts, being more inclined to admiring architecture and engineering, and few of the exhibits really engaged us; we ended up feeling that we would have been better off just appreciating the external structure. 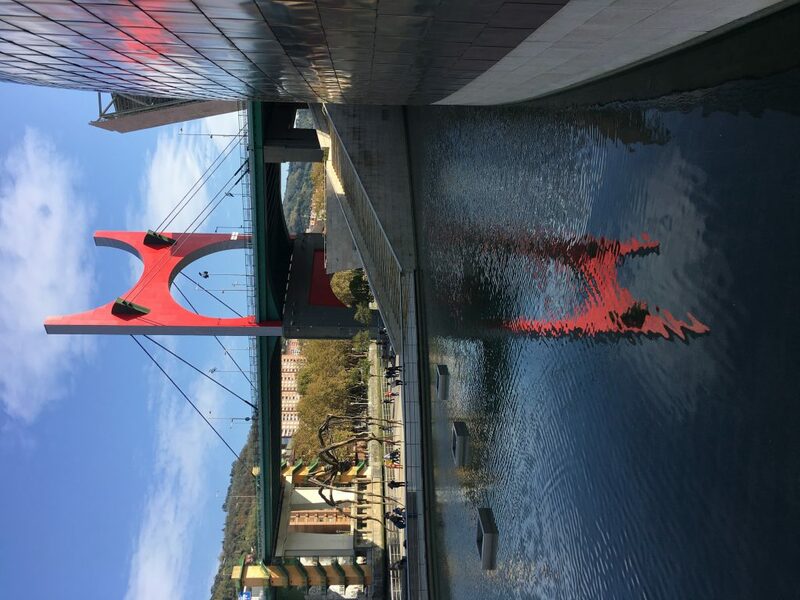 Following our visit to the Guggenheim we walked along the river, crossing bridges backwards and forwards as we moved towards the older parts of the city. 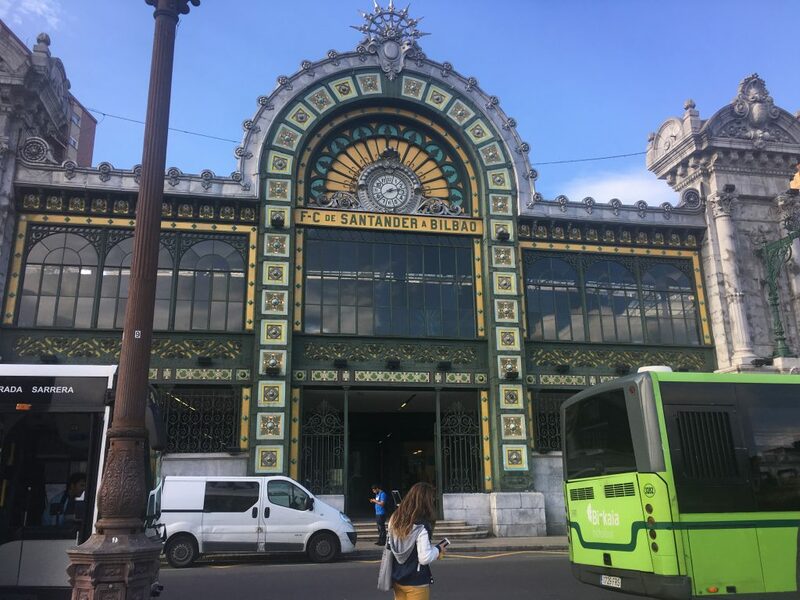 Eventually we ended up at the La Ribera market, an indoor market with various kiosks selling fresh fish, meat and vegetables as well as cured meats and cheeses. It wasn’t the biggest market I’ve been to, but it had a nice little area of bars serving pintxos (the Basque region’s version of tapas) and we decided to eat our lunch here, sampling various options; octopus and elvers, meat and cheese croquettes, stuffed peppers and other tasty portions. We had been in the wider Basque country since the south west of France, but here in Spain it was more obvious with Euskara, the language of the Basque people, appearing on road signs and on information boards with equal prominence to Castilian Spanish. The origins of the Euskaran language – which is unrelated to any other Indo European language – and the genetic origins of the people of the Basque region make interesting reading and provide context for cultural differentiation and more recent political activity. 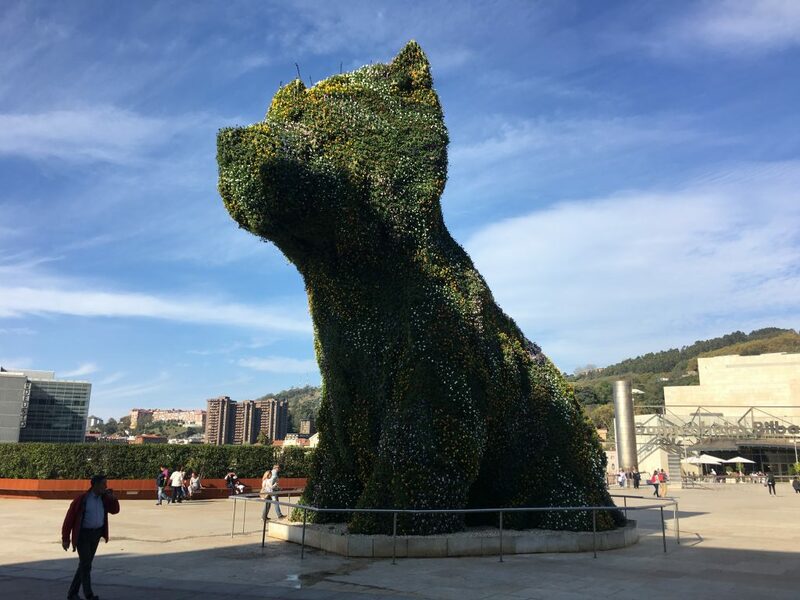 Once we had eaten our late lunch – typically Spanish timing – we headed to the tourist office to see if they could provide any information about the surrounding countryside, but they were very focused on the city and didn’t have much to offer apart from their free wifi. We sat in their cool air conditioned building for a few minutes updating some apps and information on our phones before heading back towards Bertie. Once back we decided that we would move on to spend the night by the coast rather than in the suburbs, and after saying that we would be heading west…we went east, just a short distance to the seaside town of Bakio where we parked up in the car park and took a stroll down the beach in the fresh air.